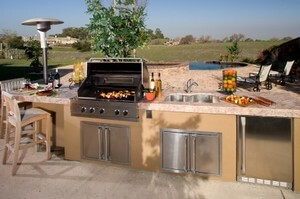 An outdoor kitchen grill is the most essential part of your outdoor cooking space. Knowing what you want and what you can afford before you begin designing your outdoor kitchen can get you off to a good start. The first question is do you want a gas or a charcoal grill? Many people like the convenience of gas, but there are some who prefer the art of cooking over charcoal and wood. Gas does a good job of grilling and is fast to heat your grill. Charcoal provides more flavor, however and you can also use a charcoal grill as a smoker. You can find charcoal grills that have levers to raise and lower the coals to control the temperature your food is cooked at. If you prefer a gas grill, you need to learn a lot more about what you're looking for in a grill. Choosing a gas grill for your outdoor kitchen grill can be a bit challenging. There are several different brands on the market that range from very inexpensive to very expensive. Knowing what you're looking at in the store will give you a good advantage. First of all, most gas grills are plumbed for propane. If you prefer natural gas, you may need to talk to a professional about making some adjustments and plumbing it to the natural gas lines in your house. If you like to use propane, there will be no problem. How big of a grill do you need? Most gas grills range from two to six burners. Be sure to get a grill that has individual controls for each burner so you have more control over your heat. Side burners can also be useful in preparing side dishes, sauces and melting butter. The general rule of thumb when deciding how large of a grill you need is 400 square inches of grilling surface for the average cook. You can also add extra shelves and warming racks to increase your cooking surface. Learn about BTUs. British Thermal Units, or BTUs, are used to measure the heat output of your grill. This can be a bit confusing since a grill with smaller burners and BTU rating can get as hot as one with more BTUs. What is really important is how well does your grill sustain its temperature for better cooking. How do you plan to distribute the heat with your outdoor kitchen grill? Lava rocks work well and are inexpensive. They do tend to collect residue from cooking, however. Pumice works very similar to lava rock, but collects less residue. any residue that collects gets baked off. Ceramic is more expensive, but it lasts longer. Heat bars, or plates, are metal bars that allow heat to rise. Instead of collecting residue, it dissipates as it falls on the hot metal. Igniters are an important part of your gas grill, and no matter how much you pay for a grill, are the most likely part to cause trouble. A push button igniter makes a single spark each time you push it, while a knob igniter gives two or three sparks for each turn you give it. If you can, get an electronic igniter, which is powered by a 9 volt battery. If your igniters do fail, you can always use a long match or a lighter to start your grill. This may be a little more inconvenient, depending on your grill model. Stainless steel grills will last a long time and continue to look good. The grilling surface is also important. If you can get stainless steel grill cooking surfaces, they work very well. Porcelain-coated surfaces work pretty well too. Some come with cast iron as well. A thermometer is very important. Many outdoor kitchen grills come with one built in. You may also want to invest in a meat thermometer with a separate probe that you can insert in large pieces of meat so you can be sure to cook the meat optimally. By choosing your outdoor kitchen grill and other appliances before you finalize your design, you will find it is easier when putting your outdoor kitchen together. Be sure and shop around so you can find the perfect grill to suit your needs.